As usual the MDXC’ s guys are working hard to give a good surprise to the international community of dxers and Iota chasers. This time the team leader , Antonio IZ8CCW and the team co-leader, Gabriele I2VGW, with S21AM help, are in pole position to put on a new ambitious project: a Dxpedition in Bangladesh and the real possibility to establish a real cooperation with the local hams to assist in future dxpedition. The target will be once again the same reached, with great media enphasisis and success, in Brunei last year : a twinship with the local ham radio.As a matter of fact the next Dxped by Mediterraneo Dx Club is going on in the best of the way. The team, formed by 20-22 operators from 9 Countries. They are going to stay on air for ten days with the usual antennas farm for all bands/mode with 4 Icom 7000, 2 elecraft k2, 1 Icom 7200 and 4 amplifiers. The exact date 19 to 29 November 2013. Further infos coming soon and soon will be a dedicated web site online.Of course any donation a sponsorship for this new project will be very welcomed. 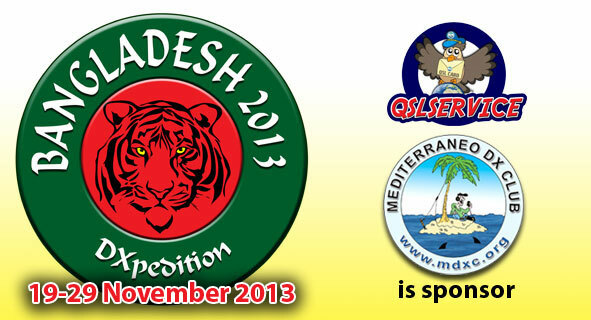 The Mediterraneo DX Club is main organizer of Bangladesh Dxpedition Free internal QSL service available for all MDXC Members. You may contact me In which area you are living at Dhaka ? ?